I once read somewhere that a true work of God often moves from difficult to impossible to done. In other words, the situation starts out as difficult and you begin to pray about it. However, as an English proverb says, the mills of God tend to grind slowly. So while you are praying, rather than improve, the situation may so deteriorate that by human reasoning, it is then beyond repair. But don’t conclude that God cannot help anymore. In fact, that may be when He has chosen to show up. That was the case in the story of Lazarus recorded in the gospel according to John, chapter 11, verses 1 – 45. Lazarus was sick when his sisters, Mary and Martha, sent word to Jesus hoping he would come immediately and heal him. But Jesus DELIBERATELY DELAYED that God might be fully glorified in the situation. The sisters had no idea what His agenda was, they only knew that their brother was not only dead but stinking in the grave by the time He arrived. Jesus didn’t apologize but assured them that if they believed, they would see the glory of God. What happened eventually? When He got to the tomb, Jesus shouted, “Lazarus come forth,” and THE DEAD, DECAYING BODY SPRANG TO LIFE. Lazarus arose! So if you are facing a tough situation and you’ve been calling on God but He seems silent, that doesn’t necessarily mean He doesn’t care or He is impotent. Has he assured you of victory? Then hang in there. Weeping may last all through the night but joy comes in the morning as Psalms 30:5 tells us. Do not give in to panic as Saul did in 1 Samuel 13 and lost God’s blessing on his kingship. Although the Philistines were massing a huge army to attack Israel, although Samuel did not come at the expected time, although his army and the rest of Israel had begun to scatter and hide, although he felt trebly vulnerable because a sacrifice had not been offered to obtain God’s favor for the battle; God blamed him for taking matters into His own hands and offering a sacrifice he wasn’t qualified to, rather than waiting as instructed. Hebrews 6:12 admonishes us to “imitate those who through faith and patience inherit what has been promised” and in chapter 10:23 of the same book, we are advised to “hold unswervingly to the hope we profess, for He who promised is faithful.” Just remember that God whose ways are beyond human understanding often delights in moving matters from difficult to impossible to done! Halleluyah!!! Amen to that, all hope is not lost. It can't be because God is alive! Even the thiings we term are often working out His good purpose. Halleluyah! Be richly blessed of the Lord, Flawlex, in Jesus' name. Thank you too, my dear, and may God bless you more in Jesus' name. Very inspiring and, personally,timely too. Our God is able; He never fails. Thanks for sharing Edith. So glad you came by, Ziri! Glory to God and abundant blessings upon you and yours in Jesus' name. That's true! Glory to His name and blessings to you, my brothet! God will always send you knocking at the incapacitated door of my heart when I most expected it. This message is uplifting, edifying and inspiring. I pray for more inspirations from God. Thanks! Thank you too, Benjamin and glory to God, who inspires and who will perfect the things that concern you in Jesus' name. And bless you too, beloved! I appreciate! Thank you, Andrew. You are greatly blessed in Jesus' name. 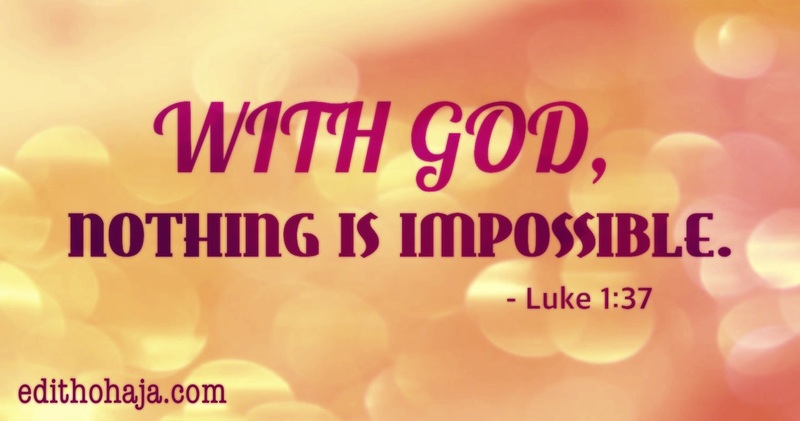 With God, nothing is just impossible. God is the holder of every power and can do all things in His time. I love the post Ma. Praise God! Doesn't it make you confident to know that our Father in heaven can do all things. Nice post ma, may God continue to inspire you beyond your imagination. Amen. God bless you richly, Georginah, in Jesus' name. Very inspiring indeed. God, through His servant Ezekiel, made dried bones come back to life; He resurrected Lazarus after he had been dead and buried for 4 days; The man at the pool - who has spent 38yrs by the pool without hope, was healed in few minutes; the blind man from birth regained his sight in less than one day; the lame man at the beautiful gate was made to walk again by mere mention of His name. The bible records that at the mention of His name, every power - both in heaven and on earth - will bow down. An ancient saying goes: there's always a light at the end of every dark tunnel. This piece, I know is all about hope. having seen all that God did in the past, and those He is still doing, why shouldn't we trust in Him to lead us out of every circumstance? Remember, He said that He is the same yesterday, today and forever; and even if a mother deserts her child, He will not desert you. Preach, man, preach! I couldn't have said it better. Thank you, Collins! Amen! Thank you for your wonderful input. We have every reason to praise God always no matter the situation. He will never leave us nor forsake us and His promises are yes and amen. Beautiful post. Thanks for giving hope to many and healing our hearts with your lovely posts, ma. Thank you too and glory to God, my dear! This post is really inspiring..I can do all things through Christ who strengthens me..God bless you ma.. Yes, you can. May God bless you richly too in Jesus' name. Seriously ma, impatience has become one of the tools that the devil is using badly in striking we Christians. And I believe that's because some of us gave him that chance or better still, liberty. We tend to forget so soon that patience is expected to be our national anthem as one of the "fruits of the spirit." The moment we begin to practice PATIENCE with God, his blessings won't appear too far to us. it's a nice piece ma. I love it, Well done. Amen and amen. I'm blessed by your visit and your comment, my dearest sister Kathy! May God help us to hold onto Him even in the face of contrary circumstances because He is able to do all things. Very true. If it is not impossible, man will take the credit for it, but when it is impossible like our Lord Jesus Christ said in the scripture you cited, God will be glorified. So, the situation can degenerate from bad to worse to impossible to done so that many will see our testimony and conclude that God is definitely behind the miracle. I really enjoyed this. This is an encouragement to all believers, no matter what happens, no matter the situation, no matter what the enemy lays as obstacle, we should hold on to God. Even when the situation seems impossible, we should still hold on to our faith, because our Father never fails.